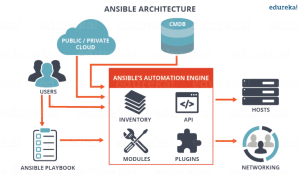 Ansible is a simple automation language that can perfectly describe an Information Technology application infrastructure. With Ansible, Information Technology admins can begin automating away the drudgery from their daily repetitive tasks. Ansible is an open source automation platform. It is very simple to setup and yet powerful. 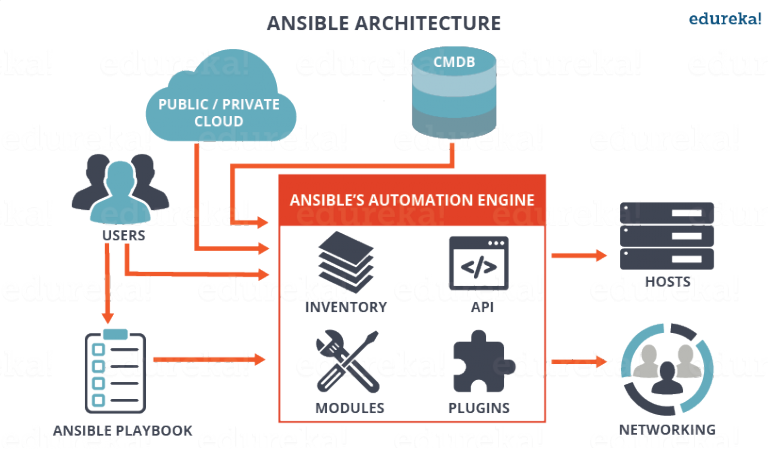 Ansible can help you with configuration management as well as task automation. It can also do Information Technology orchestration. For eample, Ansible can upgrade the web servers one at a time and while upgrading it can add the new web server to the load balancer and enable it in your Nagios monitoring system. So in short you can handle complex tasks with a tool which is easy to use. ⦁ Controlar Machine: The Machine where Ansible is installed. This machine is responsible for running the provisioning on the server you managing. ⦁ Inventory: An initialization file that contains information about the servers you are managing. ⦁ Playbooks: The Entry point for Ansible provisioning, where the Automation is defined through tasks using YAML format. ⦁ Tasks: A block that defines a single procedure to be executed e.g. Install a package. ⦁ Module: A module typically abstracts a system task, like dealing with packages or creating and changing files. Ansible has a mltitude of buit-in modules, but you can also creat custom ones. ⦁ Role: A pre-defined way for organizing playbooks and other files in order to facillitate sharing and reusing portion of a provisioning. ⦁ Play: A provisioning executed from start to finish is called a play. in simple word, execution of a playbook is called a play. ⦁ Facts: Globle variables containing information about the system, like network interfaces or oprating system. ⦁ Handlers: Used to Trigger service status changes, like restarting or stopping a service. Ansible allows you to creat groups of machines, describe how these machines should be configured or what actions should be taken on them. Ansible issues all commands from a central location to perfom these tasks. Ansible can also be used to automate different networks. If you are interested in getting trained in Ansible, Click here. For Applicable exam fees Ansible Certification, feel free to call on 09371005898 / or You can also fill up this enquiry form with your information and we will get back to you. The public vs private cloud debate is a path well trodden. While technologies and offerings abound, there is still confusion among organizations as to which platform is suited for their agile needs. One of the key benefits to a cloud platform is the ability to spin up compute, networking and storage quickly when users request these resources and similarly decommission when no longer required. Among public cloud providers, Amazon has a market share ahead of Google, Microsoft and others. Among private cloud providers, OpenStack® presents a viable alternative to Microsoft or VMware. What technical features do the two platforms provide? How do the business characteristics of the two platforms compare? The tables below name and briefly describe the feature in OpenStack® and AWS. To run an application you need a server with CPU, memory and storage, with or without pre-installed operating systems and applications. Sizes Flavors: Variety of sizes: micro, small, medium, large etc. Variety of sizes: micro, small, medium, large etc. How much memory and CPU and temporary (ephemeral) storage is assigned to the instances/VM. Operating systems offered Whatever operating systems the cloud administrators host on the OpenStack cloud. (Red Hat certifiesMicrosoft Windows, RHEL and SUSE) AMIs provided by the AWS marketplace. A base configuration of a virtual machine, from which other virtual machines can be created. OpenStack administrators upload images and create catalogs for users. AWS provides anonline marketplace of pre-defined images. Catalogs of virtual machine images can be created from which users can select a virtual machine. Users can upload their own images. Users can upload their own images. How can understanding Linux enhance a career? This question is interesting because there are two drastically different answers. The first is the obvious answer that you can find through websites and studies everywhere, but the second is a little more subtle. And a lot more awesome. You might be reading this post because you read articles like this one from The Linux Foundation regarding hiring demands for Linux experts. Or perhaps you read the 2013 report and realized there’s a trend for hiring Linux professionals. Basically, if you want a job in technology, being a Linux expert is like finding a golden ticket in your Wonka bar. But what about non-Linux experts who are professionals in their own fields? Does the unemployed or underemployed Microsoft administrator have to start over and look for an entry level job in a field they don’t know, with zero experience and almost zero enthusiasm? How on earth did I get that job when my resume screams Linux and Open Source? It’s simple: because working with Linux forces you to be a thinker. Sure, that’s a generalization, but it’s pretty common. It’s also often the truth too. Being comfortable with Linux means that you’re flexible. There are tons of Microsoft-only server rooms, but in an office environment, there’s rarely a Linux-only server room. That means Linux users have to be comfortable working with multiple operating systems. It also means they tend to have incredible troubleshooting skills, and by their mere interest in Linux, it shows they can (and do) think outside the box. So how has Linux helped my career? It helped me land a job at a university that doesn’t have a single Linux server in their entire infrastructure. Linux professionals don’t just fix computers, they solve problems. That’s what makes them so invaluable. How can Linux change your career? Yes, I’m about to get a little grandiose. But I’m passionate about changing people’s lives, and I’ve seen it happen, so at least consider this list of ways Linux can help your career. Quite simply, you can get a job. Obviously, there are many, many places looking for individuals who are skilled with Linux. The links above will attest to that. But that’s just the obvious answer. Learning Linux helps you look at your skillset in a different light. No longer do you see yourself as a list of certifications and abilities, but rather a forward-thinking problem solver. All of your skills are just arrows in your quiver, and your brain is what makes you so valuable. Remember, a Google search can teach you how to install an Apache server, but only a well-trained problem solver can know when it’s appropriate to do so. You can find a job you love. Once you realize how valuable and flexible you’ve become, you can focus more on finding a job you love. We all need to pay our mortgage, but if your job options are broader, the chances of finding your calling are much greater. You can offer employers or clients well-rounded advice. Remember from past blog posts, there are times Linux isn’t the right choice. The only people who will be able to tell the difference are those familiar with Linux and the alternatives. Your Linux expertise can be invaluable to someone who is implementing a SharePoint infrastructure. Should they be using Linux-based solutions instead? Be that person who can help them decide. Your rewards will be more than just monetary. I promise. Reread number 2. Truly, making the mental shift from a technician to a solutions provider is the key to success in IT. Be the answer that a Google search can’t provide. You don’t need all the answers; you need to know how to ask all the right questions. I’m excited about the future of technology, and the future Linux professionals will play in it. It’s certainly not too late to jump into the mix and start learning Linux. As the hiring focus shifts more and more toward DevOps type skills, a Linux skillset (and more importantly an open source mindset) will be the types of things that will make you very employable. Even more important than that, however, is that it will likely leave you a fulfilled person. At the end of the day, that’s the key to a successful career. OpenStack is a cloud computing platform that controls large number of compute nodes , storage, and networking resources throughout a datacenter, all managed through a dashboard(Horizon) that gives administrators control while empowering their users to provision resources through a web interface. Openstack provides an Infrastructure-as-a-Service (IaaS) solution through a set of interrelated services. Ques 1: – What are different type of variables in Linux ? The Linux shell automatically determines the data type used for the variable value. Ques 2: – What does chroot SFTP means ? Ans: – SFTP stands for SSH File Transfer protocol or Secure File Transfer Protocol. SFTP provides file access, file transfer, and file management functionalities over any reliable data stream. When we configure SFTP in chroot environment , then only allowed users will be limited to their home directory , or we can say allowed users will be in jail like environment where they can’t even change their directory. Ques 3: – How to check syntax of named.conf is correct or not ? Ans: – named-checkconf is the command, which checks the syntax of named.conf file. Ques 4: – What are the different types of DNS records or Resource records ? Ques 5: – How To limit the data transfer rate, number of clients & connections per IP for local users in VSFTPD ? Ques 6: – How to change the default directory for ftp / Anonymous user in vsftpd ? Ques 7: – What are the important daemons in postfix ? Ques 8: – What is the use of Domain Keys(DKIM) in mail servers ? Ans: – DomainKeys is an e-mail authentication system designed to verify the DNS domain of an e-mail sender and the message integrity. The DomainKeys specification has adopted aspects of Identified Internet Mail to create an enhanced protocol called DomainKeys Identified Mail (DKIM). 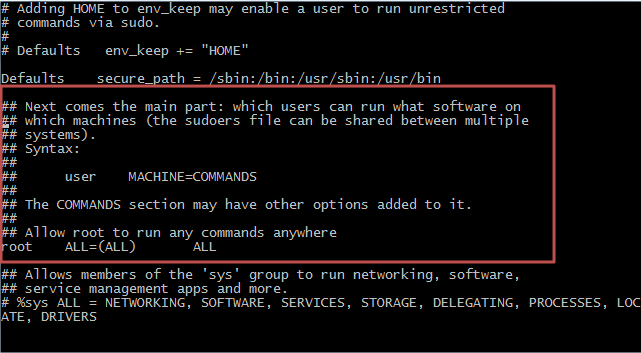 Ques 9: – What is use of sshpass command in linux ? Ans: – sshpass is a command which allows us to automatically supply password to the command prompt so that automated scripts can be run as desired by users. sshpass supplies password to ssh prompt using a dedicated tty , fooling ssh to believe that a interactive user is supplying password. Ques 10: – What is the use of blowfish options in scp command ? Ans: -Using blowfish options in scp command , we can increase the speed, by default scp uses the Triple-DES cipher to encrypt the data being copied. Ques 11: – What is Initrd ? Ans: – Initrd stands for initial ram disk , which contains the temporary root filesystem and neccessary modules which helps in mounting the real root filesystem in read mode only. Ques 12: – What is an Open mail relay ? Ans: – An open mail relay is an SMTP server configured in such a way that it allows anyone on the Internet to send e-mail through it, not just mail destined to or originating from known users.This used to be the default configuration in many mail servers; indeed, it was the way the Internet was initially set up, but open mail relays have become unpopular because of their exploitation by spammers and worms. Ques 1: – What are major and minor numbers in Linux ? Ans: – When accessing a device file, the major number selects which device driver is being called to perform the input/output operation. This call is being done with the minor number as a parameter and it is entirely up to the driver how the minor number is being interpreted. Here , 8 is the device number and 0 is the minor device number. Ques 2: – What is Nested virtualization & How to enable this in KVM ? Ans: – Nested virtualization refers to running virtual machines (VMs) inside other VMs, usually for testing purposes. Ques 3: – What is Shorewall? Ques 4: – What is NAT ? Ans:Network Address Translation(NAT) generally involves re-writing the source and/or destination addresses of IP packets as they pass through a firewall.There are two two types of natting. Ques 5: – What are SRV record in DNS ? Ans: – A Service record (SRV record) is a specification of data in the Domain Name System defining the location, i.e. the hostname and port number, of servers for specified services. proto: the transport protocol of the desired service; this is usually either TCP or UDP. priority: the priority of the target host, lower value means more preferred. target: the canonical hostname of the machine providing the service. Ques 6: – What is a Veritas Cluster server or VCS cluster ? Ans: – VERITAS Cluster Server (VCS) from Symantec connects multiple, independent systems into a management framework for increased availability. Each system, or node, runs its own operating system and cooperates at the software level to form a cluster. VCS links commodity hardware with intelligent software to provide application failover and control. When a node or a monitored application fails, other nodes can take predefined actions to take over and bring up services elsewhere in the cluster. Ques 7: – What are On-Off & Persistent Resources in Veritas Cluster ? Ans: – On-Off:- VCS starts and stops On-Off resources as required. For example, VCS imports a disk group when required, and deports it when it is no longer needed. Ques 8: – What are the Active directory requirements to install Exchange Server 2007? Ques 9: – What are Veritas Cluster or VCS User Account Privileges ? Cluster Operator :- All cluster, service group, and resources-level operations. Cluster Guest :- Read-only access: new users created as cluster guest accounts by default. Group Administrator :- All service group operations for a specified service group, except deleting service group. Ques 10: – What is Transition in Exchange Server 2007? Move on from MS-Windows and create C/C++ programs on Ubuntu Linux. We are here to help you. Information graphics or infographics are graphic visual representations of information, data or knowledge. These graphics present complex information quickly and clearly, and are easy to understand. Infographics are sources of interesting information, when you are in need of some. Reading boring, long, colorless articles isn’t so attractive and interesting than reading and viewing facts and numbers in an illustrated way. Not only an illustrated way, but a very creative, attractive and super-appealing way. An infographic on the history of Linux.